1. 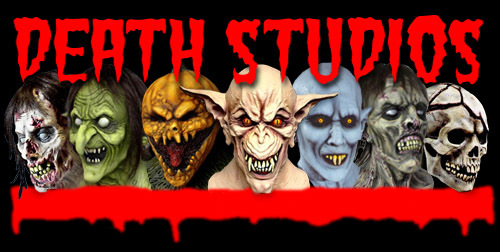 Will Death Studios masks actually look like their catalog photos? 2. Are Death Studios masks available in stores ? 3. What is the best way to store a Death Studios mask? 4. How do I care for hair on masks? 5. How do I clean my Death Studios mask ? 6. How do I custom fit my Death Studios mask ? 7. The eyes on my DS mask have cracked. How do I repair them? Will Death Studios masks actually look like their catalog photos? If you have ever bought a latex halloween mask before, you probably know that many companies feature great looking masks in their catalogs, but they deliver thin, badly painted copies with air bubbles and defects in the castings. This game of "bait and switch" is pretty common amongst larger companies. We actually make our masks here in our studio, not in Mexico or Malaysia. They are painted by me, Jeff Death, so that I can vouch for the quality of each and every piece. Our money back guarantee stands behind every piece. Are Death Studios masks available in stores ? We do not sell our masks through stores. Several are available through Trick Or Treat Studios, but those copies are NOT made by me. They are produced in Mexico. What is the best way to store a Death Studios mask? To prevent yellowing, keep your masks away from UV light (sunlight or fluorescent bulbs). Keep them in their natural shape. You can use a wig head form, but I use a tube made from 1/4 sheet of posterboard with a little newspaper in the top of the mask. If your mask becomes misshapen. you can use the heat of a blowdryer to reshape it. It helps to keep them in plastic bags, but it is not as much fun that way. How do I care for hair on masks? The hair on Death Studios' masks are put on with latex except for the hairline area. You will have some hair loss, because some of the hair was loose (it didn't come loose, it wasn't actually glued on in the first place). Save any hair that comes loose, as it comes in handy for repairs. If you brush your masks, do not brush the hairline area because the glue used in that area is not as strong. If you need to repair the hairline, you can glue the hair on with rubber cement or contact cement. How do I clean my Death Studios mask ? You may use a mild detergent or Armor-All Cleaner ( not ArmorAll Protectant) applied with a soft sponge or brush. Rinse off all cleaner. If the gloss that covers the eyes crack, it is very easy to replace. Carefully crack the remaining gloss off, the apply a small amount of Devcon brand 5 minute epoxy with a small brush. How do I custom fit my Death Studios mask ? If your mask is a little too large to see well, you can crazy-glue a piece of sponge or foam rubber in the top, back, or both, so that your eyes match up with the vision slits better. If you would like to enlarge the vision slits, try the mask on to see which side the slits need to be bigger. Remove the mask and trim the holes slightly bigger with scissors or an exacto knife. NEVER trim a mask while wearing it. If your mask is too tight, you can make the slit in the back of the mask bigger. Extra baby powder on the inside will make the mask go on easier. The eyes on my DS mask have cracked. How do I repair them? The eyes on DS masks are covered in a coating of DevCon 5 Minute Epoxy. You can remove the old gloss, and regloss them with a small amount of this 5 min. epoxy and an inexpensive art brush. The brush will be destroyed in the process.